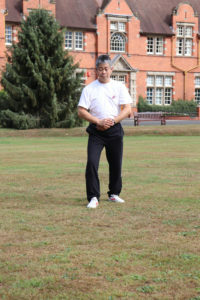 When we continue practising Qigong we will notice more changes in our breathing. Our body can move fast, slow and any other speed, no matter what we do our breathing will match as long as we are relaxed. Therefore relaxation is the most important thing. Most of the time, when we open we will breathe in and when we close we will breathe out. Also when we go up we will breathe in and when we go down we will breathe out. However, in certain movements we can sometime breathe in and sometimes breathe out. For example if we are moving in a circle or one hand is rising whilst the other hand is dropping it creates a different coordination and our breathing will not be fixed to either inhaling or exhaling. Therefore when we do a form we should not think about breathing and instead that the body find the way and this is the best way. No matter whether we breathe in or out we must breathe through the nose and the mouth should be closed all the time. When we are doing Shou Gong and bring our hands down past the face and down to the Dantian, we can find that our breathing is quite fast and we inhale and exhale many times before our hands reach the Dantian and then the breathing will settle. When we have too much Qi our body wants to absorb all of it and so we will breathe like that. So we should let it go, just relax and let the body do the work.